Check back in Fall 2017 for New Fall Product Program. Reminder-all troops are required to do service for the service unit. Volunteering at the cookie warehouse counts as your troop's service to the service unit. How long are you available-we need about 6-8 more volunteers from 12:00-2:00 and about 15 more volunteers from 2:00-4:00. Thank you so much for helping to make this Cookie Warehouse Event a success! Questions? Please contact Program Chair Dawn Miller at outpostlady@earthlink.net. Celebrating 100 years of Girl Scouts selling cookies, 1917-2017. Troop trainings will be held Nov./Dec. : check with your service unit for details. The NEW S'mores cookie will be part of our lineup for 2017, replacing Rah-Rah Raisins. The new crunchy graham sandwich cookies with creamy chocolate and marshmallowy filling (YUM!) are one more delicious way to support your Girl Scouts' next adventure! 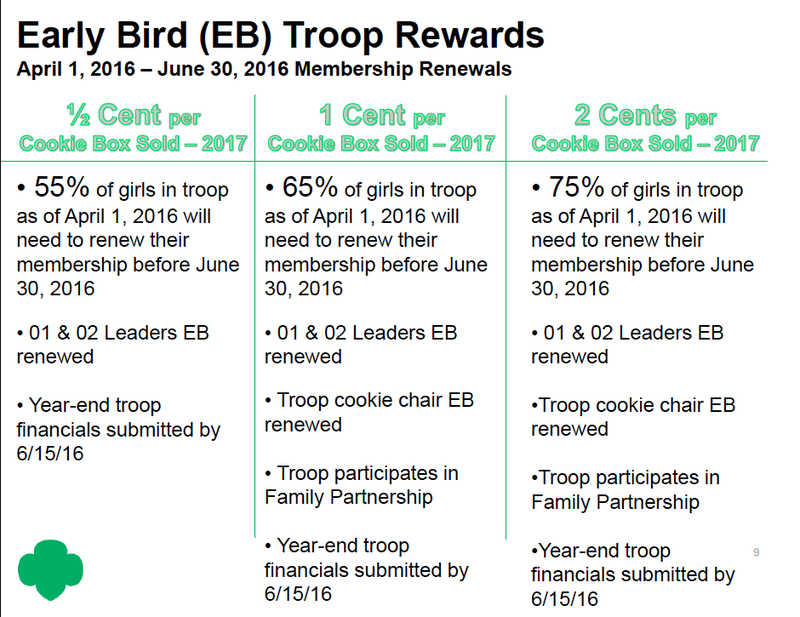 You'll want to hang on to this guide and encourage parents and troop leaders to refer to it during the upcoming cookie season, Jan. 29-March 12, 2017. It's also already available online (under "What's New" on the GSGLA homepage) and will be in the lobbies at our service centers mid-October. Need to Cancel a Booth? · If you are signed up for a booth in eBudde, the Cookie Finder is telling customers that you will be there. If your troop cancels a booth, YOU MUST ALSO CANCEL THAT BOOTH IN THE eBUDDE BOOTH SCHEDULER, which will remove it from the Cookie Finder, and customers won’t go to an empty booth site. · Give another troop the opportunity for that great location. What if another troop is in our spot when we arrive? To avoid misunderstandings, print out a copy of your booth site confirmation from eBudde and bring it with you. The troop with the printed confirmation has the permission to be at the site. Be kind, respectful and considerate at all times and do not involve the host business. Settle any disputes away from the girls and then explain to them how you resolved the conflict. You are the face of Girl Scouts! Girls are watching and learning from adults – you need to demonstrate model behavior at all times. Thank you. · Cash box and extra cash to make change for customers. Please do not ask the host business for change. Adults should take direct responsibility for a cash box at all times with the intent to deter theft. Fanny packs and money belts are good options for holding large amounts of cash. · Card table or similar so you have a place to display your cookie boxes. Please do not use a location table. Those tables are generally for paying customers of the establishment. · Shopping bags. One-use bags are great when recycled for cookies. Start saving them now. Customers will buy more if they have an easy way to carry them. · Copy of troop booth site confirmation from eBudde. · Important telephone numbers: Troop Leader, SU Boothing Chair, Cookie Program Chair, SU Manager and PSM. · Extra and enough cookies! · Gift of Caring collection canister and/or sign. · Masking/Painter’s tape for affixing signs to your table, pen, sharpie marker. · Place all your extra supplies under the table, out of sight – keep your booth neat! · At least two girls PER DOOR are required to be present at all times. This includes when a business has two doors. The minimum number of girls and adults should be at each door. Some large sites (such as Wal-Marts) are designated as to which door the booth is to be held. If you are unsure, please check ahead of time. · FOR DAISY/BROWNIE/JUNIOR: Two adults are required to be present at all times, at least one of whom is female. · Exception FOR SENIORS/AMBASSADORS ONLY: a minimum of two girls but only one female adult needs to be present at all times. Two adults are preferred, however. · Troops should have a plan for safeguarding money. Adults should exercise caution in holding large quantities of money at the point of sale. If need be, make arrangements for an additional adult to deposit money, particularly from high traffic booth sales. Bring a deposit slip and ATM envelope with you to facilitate a bank run by another parent. · Adults must handle ALL money for Daisy Girl Scouts. · Adults should supervise girls closely at all times, including while visiting the restroom or on breaks. · Girls should not follow customers into a store or parking lot, even if promised a sale. Ask customers to return to the booth to make their purchase. · Girls should never approach cars to make a sale. · Girls should be easily identifiable as Girl Scouts by wearing a Membership Pin and/or official uniform, tunic, sash, vest or other Girl Scout clothing. · Always dress neatly and be prepared for the weather at all times. · Always arrive on time to your assigned location and stay until your shift is complete. · Upon arrival, check in with the store/location manager or previous troop to advise them of your presence and thank them for supporting Girl Scouts. Ask them where they would like you to set up your booth. Before leaving, notify the next troop of any store management requirements. · Follow all rules and requirements of the location. Some requirements may have been entered into eBudde if they are non-negotiable on behalf of the management. Be aware of this as you choose your sites. Remember, we are guests! · Troops should bring all of their own supplies to set up their booth. · Do not hang anything on the walls of the location. If you have posters to display, neatly attach them to your table or use a table tent. Girls may also hold signs. · Girls and adults should behave in a manner that is befitting a Girl Scout and appropriate to a public place. No roughhousing, running, inappropriate language or loud voices, etc. · Greet people warmly, smile and remain pleasant under all circumstances. · Girls should approach customers only as they are leaving the location. Thank everyone, even those who don’t purchase. 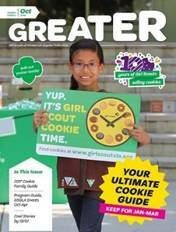 · Only Girl Scouts and supervising adults should be present at cookie booths. No tagalongs like friends or siblings. · Do not block doorways or stand more than 5 feet away from your booth. · Keep your boothing site neat at all times. · Never leave your booth or cookies unattended. · Cell phones, iPods or other electronic devices should not be used during your boothing shift. Exception: Adults who are accepting credit cards on their smart phone. · Do not eat or smoke anywhere near the booth site or anywhere visible to girls or customers. · Adults may assist, but cannot sell Girl Scout cookies. · girls, checks on your booth’s appearance, gives instant rewards for troops that are doing things the best they can. · Respect the next scheduled troop by being prepared to turn over the booth site on time. Do not stay longer than your scheduled shift. · Clean up ALL trash. Do not leave empty boxes or trash at the booth site or use trash cans at the boothing location to dispose of your trash. Clean up should be completed as part of your booth time, so the next troop can start on time. Girl Scouts always leave a place cleaner than they found it.